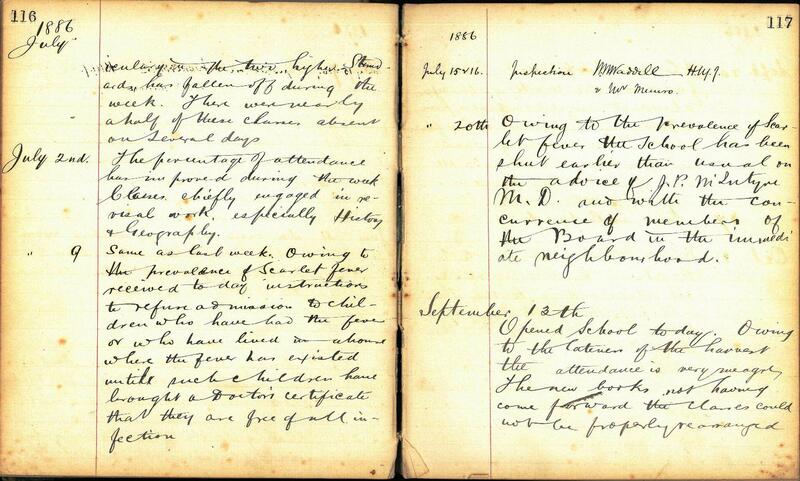 Recording attendance levels and the reasons for non-attendance of pupils was a very important element in the keeping of the school log book. After the Education Act of 1872, it was compulsory for children to attend school and the local authority was vigilant in upholding the law. It was important for the Head Teacher to show in the log that attendance at the school was good unless this could not be helped. 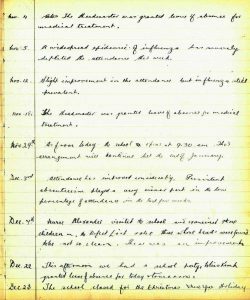 Consequently, Head Teachers were diligent in recording instances of illness amongst pupils and teachers and therefore the log is a good source of information about epidemics, particularly in the years before the formation of the National Health Service and before childhood illnesses were easily treatable with antibiotics. When there were epidemics, students were kept off school to avoid infections. Some diseases such as measles, scarlet fever and influenza could and did kill children. 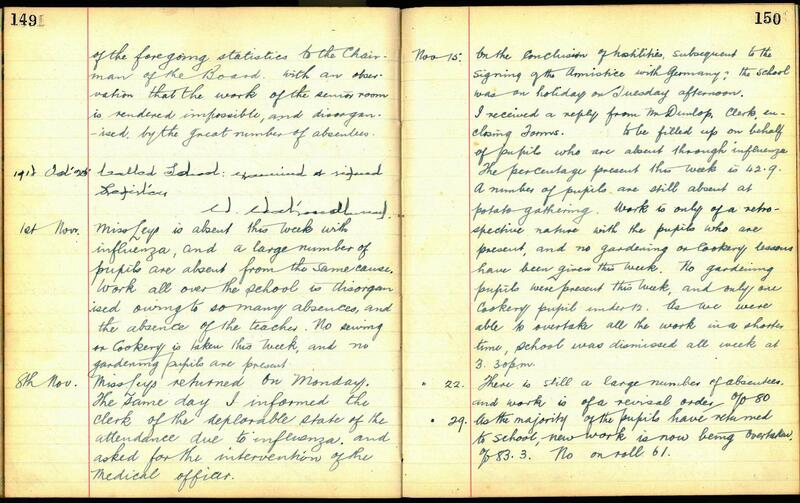 This school log from Doune in 1886 shows the measures taken when there was an epidemic of scarlet fever in the area. The Head Teacher records the absences and then the measures that were being taken to halt the spread of the disease. 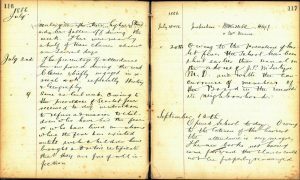 First, in July, the school was to refuse admission ‘to children who have had the fever or who have lived in a house where the fever has existed until such children have brought a doctor’s certificate that they are free of all infection’. Later in the same month, the school closes early for the summer holiday because of the epidemic on the advice of a doctor and according to the wishes of the School Board. Scarlet fever is a highly contagious infection that causes various symptoms including a distinctive rash. It can cause rheumatic fever and arthritis in later life and was a leading cause of death in children in the 19th and early 20th centuries. The influenza epidemic of 1918, known as ‘Spanish ‘flu’ is well known. 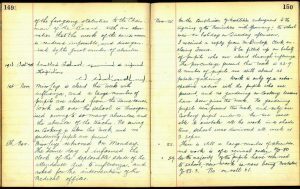 This log book from Croftamie school shows the impact that the epidemic had there in November 1918. At one point, nearly half of the children were absent from the school with the disease. 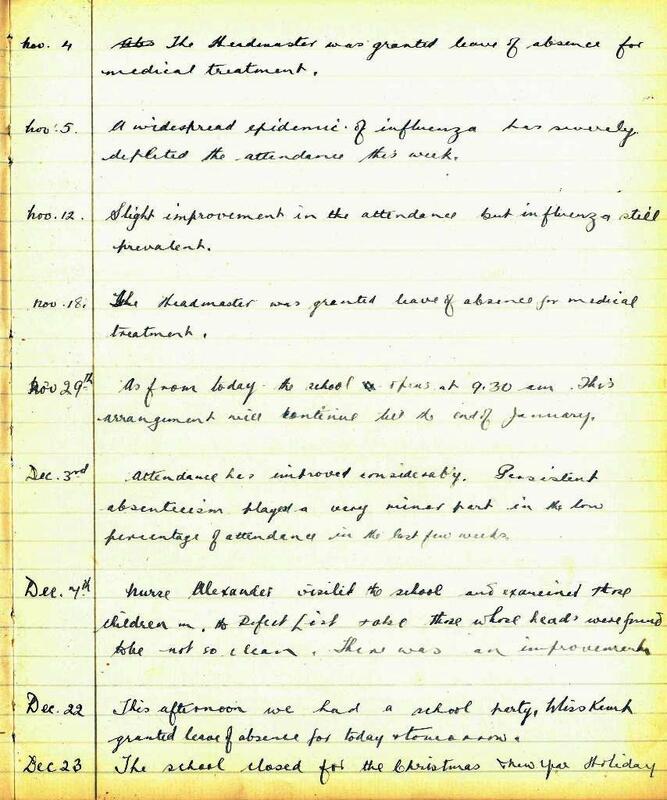 Influenza was still causing problems in 1943, as this extract from Callander Primary School log book shows. Even the Head Teacher was absent to receive medical treatment, although it is not clear if this is for ‘flu or for something else. With the advent of antibiotics and the National Health Service, the health of children across the whole of the UK improved from the late 1940s onwards.